In overall good condition, a 1796P light cavalry officer's campaign sabre, made by J J Runkel, with monogrammed blade and scabbard, and clear though tenuous link to one Captain William Tomkinson of the then 16th (Queen's) Light Dragoons who saw action at the Battle of Waterloo. The blade and scabbard are engraved in period cursive script with the initials "W T" (we have had this confirmed by an expert). 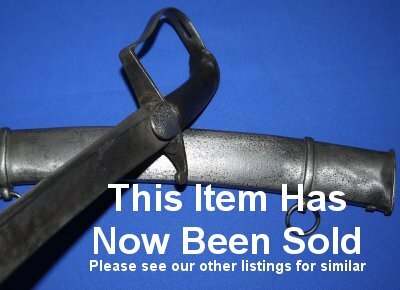 The sabre was bought by us at auction in the UK where the seller wished to remain anonymous, but we managed to get "There is a reported Queens Lancers" officer link to the sword". The Queens Lancers were the 16th (Queens) Light Dragoons at the time of Waterloo. It is a J J Runkel sword, so pre-1809, which rules out one of the two officers serving with the 16th at Waterloo (as one was recently commissioned "cornet" or second lieutenant). The 31 5/8 inch blade has been modified towards the tip end; the normally more flared point section has been reduced down to more closely resemble the French light cavalry counterpart, and to reduce the sabre's weight. The blade has period nicks to the cutting edge; this sabre has seen action, for sure. The 16th (Queens) Light Dragoons saw heavy action in both the Peninsular War and 100 Days War (Waterloo). It is possible the blade was damaged during the former then reground and used in the later. J J Runkel made officer's swords, not trooper's swords. The scabbard on this sabre clearly is original to the sabre as the initials appear on both. It is therefore an officer's campaign sabre; a sword designed to be used in battle by an officer; no gilt and blue, just pure hacking ability. The blade has been cleaned over time. It is still firm in the hilt. The hilt has age. The smooth grip is a replacement. The scabbard is equally as aged as the hilt. The sabre sheathes and draws well enough. Price. If this sword did not have the very, very tenuous link to the 16th Light Dragoons, it would only affect the value downwards by around £200 because it clearly has seen battle for one light cavalry regiment officer or another. If this sword had a more substantial link to Captain William Tomkinson, it would perhaps be worth well over 5 times what we are asking. Our price is £xxxx (too late, now sold - original sales price divulged for small fee). Please quote item reference L43 (1196). Further / full sized images available upon request.